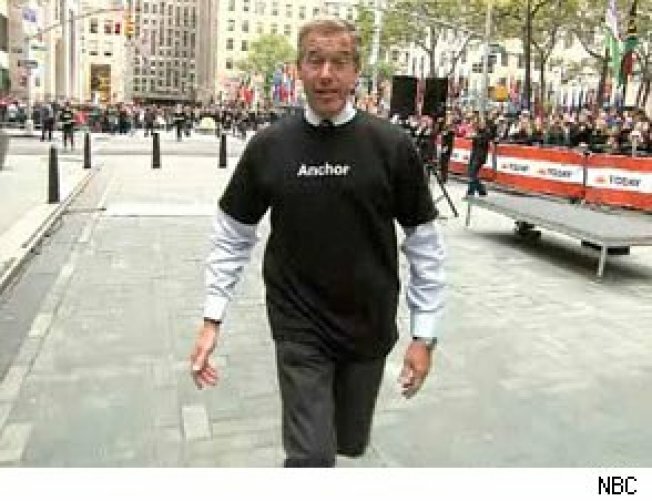 Brian Williams even got in on the action. NBC Nightly News anchor Brian Williams used a guest spot on Morning Joe to take a gentle dig at the The New York Times' newfound obsession with the borough of Brooklyn. "I think people are going to look back at 2010 and look at the iPad," said co-host Joe Scarborough last Friday, when discussing his thoughts on the story of the year. Williams, stone-faced and serious, disagreed. "The media story of the year in 2010 was the New York Times' discovery of Brooklyn," he said on the MSNBC morning program. "Once a day there's a story about all the riches offered in the borough. There are open air markets, like trading posts in the early Chippewah tribes." "They make grilled cheese in the streets," he added, making note of all the street fairs and organic food markets that have inundated parts of the borough and many, many pages of the paper. The website NYTpicker, which says "devotes intself exclusively to the goings-on inside the New York Times", picked up the video from last week's episode off of YouTube and transcribed the anchor's funny tirade. The site, which is run by anonymous journalists, regularly comments on the newspaper's various obsessions, errors, and gossip from inside the paper. Williams' bit is funny considering the excessive coverage the borough has gotten this year in the Old Gray Lady, as well as the way the paper became so aware of how it reported on cultural stories. In August, the Times published an article announcing their efforts to limit the use of the word "hipster" from their paper. They had used it more than 250 times in the past year, with many of those stories focused on Brooklyn. They also publicly noted their trying to limit the word "tweet" and refusal to use the word "girlfriend"--famously referring to Mayor Bloomberg's ladyfriend, Diana Taylor, as "companion." Two weeks ago the paper published a trend story on the front page of their Thursday Styles section, declaring a new "trend" for young, urban, trendy professionals -- not hipsters -- hiring bartenders for their holiday parties. They wrote about a 33-year-old living in a tiny Williamsburg studio who hired a bartender to serve vodka punch and rum eggnog in plastic cups. It is the perfect example of what Williams' deemed the story of the year--young, cool people doing young, cool things in a borough far from the steel headquarters of the Times. What will be the story of 2011? Only Sunday Styles can tell.